Growing up as an only child, there wasn’t much I wanted more than to be (and to have) a sister. My first two years of high school were spent within an all-girl class setting, and as I began to form deep, familial-like bonds with other young women my age, I quickly learned what sisterhood is —and is not— as well as the deep value it can and should hold in a woman’s life. The dictionary defines sisterhood as “a group of sisters…or an organization of women with a common interest” and “congenial relationship or companionship among women.” Whether your sisters are the ones with whom you share your DNA or simply the friends in your life with whom you share your deepest and truest self, experiencing sisterhood is truly a gift worth celebrating! So, in case you needed any more, here are eight reasons to value your sisters (biological or otherwise) today and every day of your life. 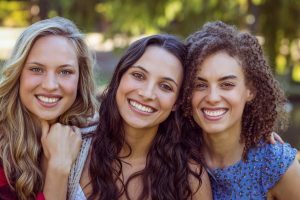 While we appreciate our sisters for sharing in our laughter and celebrating the good times with us, it is the difficult days which solidify our appreciation for their role in our lives. Whether its standing up for you when others cast you down, believing in you when doubt creeps in or simply holding your hand and providing a crying shoulder when it is needed most, sisters are the ones who look out for your best interests and remain loyal when it’s the hardest to do so. And you can’t help but love them for it. Whether they’ve known you forever or for less than a year, someone as close as a “sister” has likely seen every side of you — the good the bad and the ugly. Yet a true sister continues to love you unconditionally in spite of the ways you may have failed them in the past or the guarantee that you’ll fail them at some point in the future. They’re proud of what you’ve accomplished and forgiving of your shortcomings, and if you’re anything like me, it’s a breath of fresh air to be loved in that way. Some sisters share everything in common while others couldn’t be more beautifully opposite, but either way, having sisters from similar and different walks of life can lend valuable lessons. The different experiences your sisters bring to the table no doubt widen your perspective and broaden your horizons. Similarly, it can be a great comfort to learn from those who have been in similar situations as the ones your facing. Your willingness to learn from them can shed an unbiased (or less biased) light on what you’re going through. In other words, you may not always be right next to each other, but you’ll always have them in your life — to love you, support you and even drive you a little bit crazy (in the best possible way). Because they know you so well and understand where you come from, your sisters “get” you on a level other people just don’t often to the point of knowing exactly what you’re thinking from just the look on your face. Human beings are social by nature, so it’s important to have meaningful and trustworthy relationships. There is something so significant and fulfilling about being able to share your life’s hardships and joys with someone you love, especially when that someone is as close to you as a sister. It simultaneously magnifies the joys and lightens the burdens you experience in life. Your sisters are often your biggest cheerleaders who, even by their mere presence in your life, can inspire you to be and do more. This is especially true when your sisterhood is an organization or group of like-minded women who share your same values and dreams. One of the biggest gifts bestowed upon women by sisterhood is the assurance of companionship; sometimes, knowing you’re not alone is all you need to continue pushing forward. When you reach the end of your life, you’ll no doubt look back and remember the PEOPLE who mattered and the memories you made with them. Your sisters / sister-friends are some of the people who will have made your time here on earth worthwhile. So, whether your sisters are the girls you’ve known since infancy, the friends who have loved you fearlessly and loyally through the most difficult parts of life, or, in our age of social media, the ones who stand in solidarity with you even though you’ve never met them in person, be sure to cherish them and take some time to remind them how grateful you are to have them in your life. Follow Us On Facebook For More Articles Like This!